While the blue wave swept across the country last week, you might have missed it if you live in Florida. Despite Democrats winning control of the House of Representatives, flipping seven governorships and state legislatures, capturing over 300 state legislative seats, passing various initiatives to expand voting rights across the country, and mitigating losses in an unforgiving senate electoral map, results in the sunshine state left Democrats disappointed. The promising election of Tallahassee Mayor Andrew Gillum as the first black Governor of Florida and the reelection of Bill Nelson to the U.S. Senate resulted in disappointing results for supporters as both narrowly trailed their opponents on election night. Gillum’s race underwent a machine recount that ended up with Republican gubernatorial candidate Ron DeSantis winning after Broward numbers were discarded due to the Supervisor of Elections failure to meet the recount deadline. A manual recount has been ordered in the senate race due to the very narrow margin between the two candidates. It wasn’t all bad for Florida Democrats. Two congressional districts, seven state house seats, one state senate seat and the agricultural commissioner seat were flipped blue. Most importantly, 1.4 million Floridians with prior felony convictions were restored their right to vote with the passage of amendment 4. This is the largest re-enfranchisement of voters in over five decades and will have national implications as the Florida electorate will drastically change, potentially giving Democrats an edge going forward. As the recounting of votes across Florida continues, we are unfortunately seeing extreme partisan rhetoric stemming from the right wing in an effort to undermine this process. Just two days after election day, Florida Governor and Senate candidate Rick Scott use his elected office to attack the very foundations of our democracy. Scott baselessly claimed that there was rampant voter fraud in the state and that liberal activists were scheming to steal the election. He directed law enforcement to investigate and sued to have recount equipment impounded, with both initiatives thankfully going nowhere. Scott is not alone. DeSantis, Senator Marco Rubio and Representative Matt Gaetz have been spreading conspiracy theorists and riling up right wing agitators in Broward County. Gaetz in particular appeared in a protest outside of the Broward County Supervisor of Elections office with members of the white nationalist group Proud Boys and other racists in an effort to discredit and stop the recount process from taking place. It’s pretty ironic to see these right wingers scream voter fraud when the reality is that voter suppression tactics deny the franchise to millions of mostly black and brown voters across the state. Every voting rights expert in the country agrees that voter fraud is a myth. A report by the Brennan Center for Justice, a non-partisan law and public policy institute, found that instances of fraud range between 0.0003 percent and 0.0025 percent. On election day in Florida we observed lines in black and brown neighborhoods that lasted several hours. 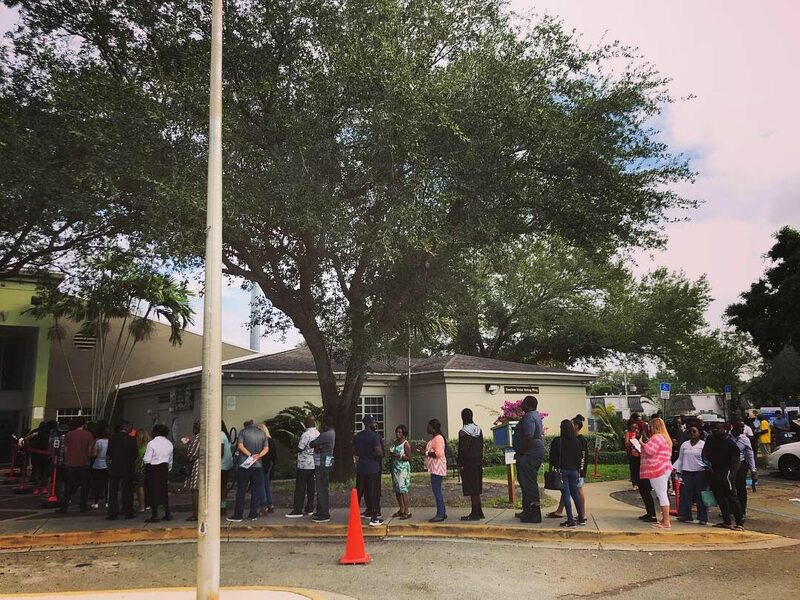 Hundreds of voters showing up to early voting sites, believing it was their assigned election day polling site and being turned away with no clear direction of where to go in order to cast their vote. People were turned away from their precincts and not offered election protection assistance. There were broken voting machines at busy polling locations. Voters who did not sign up to vote by mail were forced to use provisional ballots as a result. Katherine Grasshopper, a veteran, was among voters across the state who unwittingly signed up for vote by mail. When these voters showed up to their precincts, they were forced to vote with provisional ballots that were later discarded. Florida election law is so absurd, that former Congressman Patrick Murphy had his vote by mail ballot invalidated due to our ridiculous matching signature law. The signature law also disenfranchised people like Kallie Luten, a 25 year old with cerebral palsy who has little control over her limbs. Since 2012 she gives her mother yes or no answers for her votes. This year she voted by absentee ballot but because of her condition her signature will never match. When her mother she called the Leon County Supervisor of Election to confirm if their votes would be counted she learned that Kallie’s vote was invalidated due to her signature. I come from a family that values democracy and the right to vote. My great-grandparents led an uprising in the north of my native Argentina in the 1930s when the democratic government of Hipólito Yrigoyen was deposed in the first military coup since the adoption of the Constitution of Argentina. In the 1970s and 1980s, my family lived through the military dictatorship that was responsible for the murder and disappearance of 30,000 Argentinians in what is now called the Dirty War. I grew up hearing stories about the repression my family suffered at the hands of the Argentine government. As I observe opportunist politicians erode our democratic institutions while making it increasingly difficult for people to cast their vote, I worry about what the fate of our democratic institutions will be in this political climate. The only thing we know for sure is that the fight will continue to make sure we count every vote in this and any election, regardless of outcome. Unite the Vote for the Vote!